The Fellowship was fortunate enough to obtain a copy of THE BIONIC MAN #8 from Dynamite Comics. The comic is based on THE SIX MILLION DOLLAR MAN TV series. The story and script is by Kevin Smith with Phil Hester. Jonathan Lau supplies the art. A bitter Colonel Steve Austin is given orders to take out Hull, Office of Scientific Intelligence’s first bionic man. Steve is quickly captured by the race of bionic people. Hull offers him a choice: die with two/thirds of humans on the planet, or join him in the new bionic world he will create. Of course, Steve calls him crazy and refuses to join him. Hull sets off a 20-minute countdown until a nuclear bomb goes off and leaves him to die. I vaguely remember the TV series, so I went into reading this book without any preconceptions. This was a solid story with nice touches of humor and a little action. I was not familiar with Jonathna Lau’s art before reading this issue… it’s incredible! Of course, you have another great cover from superstar Alex Ross. 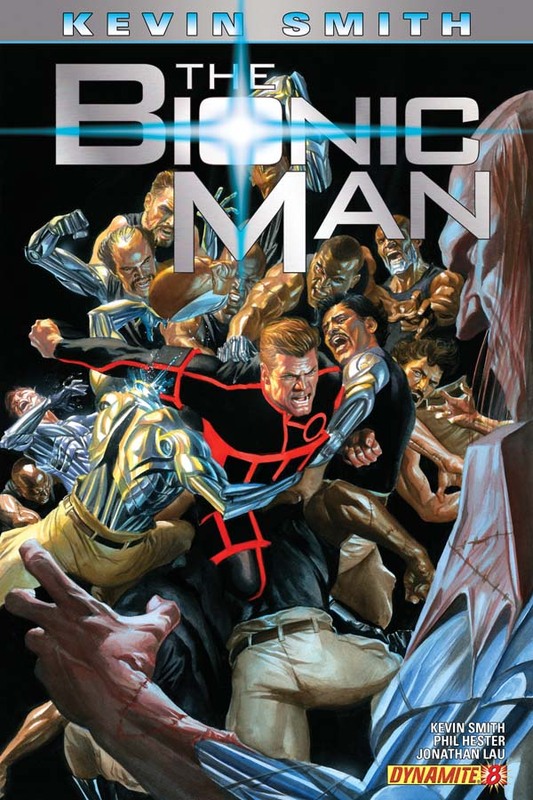 THE BIONIC MAN #8 is in comic book stores now or available at www.dynamite.net.